Martin Crowe, one of New Zealand’s greatest ever cricketers, passed away this week. A world-class batsman and pioneering captain, he was, in recent years, also a keen writer. 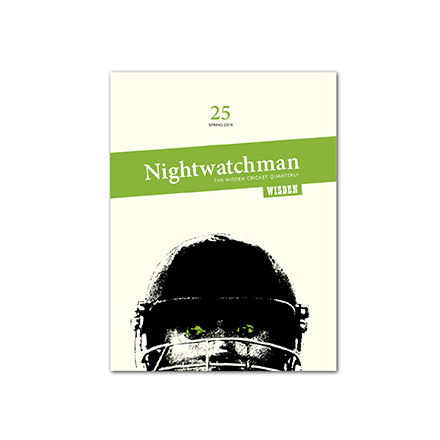 In 2014 he wrote the following piece for issue 7 of The Nightwatchman. Cricket, in particular batting, often calls for one’s temperament – that essential mind–body intangible – to stand up and carry the day. But what exactly is temperament? A combination of the mental, physical and emotional traits of a person, for sure. In essence, though, one’s temperament may simply mean one’s way of being. We all have unique ways of doing things, of batting, but what are the essentials to success and how do we maintain a temperament that represents our authentic self? The batsman knows that one ball is all it takes for him to fail. This demands a fierce focus. It’s a tough test of character to put everything aside, to trust the mind and body to work together against a small object propelled in many different ways, and with a split second to respond. It’s a trust that has to come from within, for the batsman is truly alone, calling on temperament like arguably no other sport. “This man will play better in a Test than any other match.” That is one helluva statement. And who are we to question the man making it? But what does he mean? Bradman saw enough in himself and those around him to conclude that nerve and reflex are a critical combination. To bring the best out of oneself as a batsman, the mental part needs to be fully stimulated while the physical part needs to be energetic and quick. Bradman likes a player who knows the occasion is different to any other, that the Test match is the pinnacle of the sport, and that mentally he will be challenged like never before. He uses the word “thrilled”, perhaps meaning that all the hard work has led him to this moment where he will be truly tested, fully exposed, to find out what he is capable of. And so he rises to the occasion. When a batsman fears failure, the impact on the body is stress, strain, contraction, tension or lack of energy. So when the mind worries about a past or future event, the mind – shifting out of the present – encourages the emotional charge to grow stronger, showing up in the body. As Bradman suggests, it is better therefore to shield the mind from past or future thoughts and avoid upsetting the body’s ability to sleep or eat properly before the big occasion. Staying in the present mentally allows the body to flow efficiently. In short, temperament represents the balance, or imbalance, of the mind–body equation. Bradman was most likely referring to himself. Following a shaky debut, he suspected what he was capable of. Dropped, then given time to reorganise his thoughts, he was unstoppable. He knew his temperament and how it needed to work. And his temperament was magnificent. He simply wanted to maximise every ounce of his potential. He was responsible, thrilled to be playing, mentally in control, nervously charged, and fleet of foot. And so he averaged 99.94 per Test innings – more than his first-class return, far more than any other batsman. What of a struggling temperament? A player has not slept all night, won’t eat and worries constantly about potential failure. His body is tight and twitchy. He is out of the present moment, only thinking of the consequences of failure and humiliation. He is imbalanced and incapable of performing. He scores a pair on Test debut, or close to it. Jonathan Trott comes to mind as one who thrived initially, only to see it all come crashing down. Often we mask what is deep inside. Trott’s pursuit of perfection caught up with him, exhausting his energy and revealing a hidden anxiety. A temperament needs strong layers of resilience, for if one plays long enough hurdles will appear. Mental anguish is inevitable in the brutal environment of batting on the highest stage, and so a batsman needs to understand all that lurks beneath the surface. The beauty of a cricket career is the time it allows for a temperament to recover, improve and grow. Take Sri Lankan opener Marvan Atapattu, who began his Test career with one run in six innings. His first three Tests took place in 1990, 1992 and 1994: a Test every two years, with the same temperament producing the same result. In 1997, Atapattu came back once more and struggled for another six Tests, with a highest score of only 29. He then went away and regrouped again. Three months later, in his tenth Test, he scored his first century. Through thoughtfulness, controlling his emotions, staying in the present and allowing his body to prepare better for the big event, he went on to score six double-centuries, culminating in a fine career, and is now helping other players grow and develop as Sri Lanka coach. My own first Test five innings were single-figure disasters, mainly a result of premature exposure. I had an immature temperament. A slow recovery led to an awareness of the mind–body balance required, and a good stretch followed – the next 50 Tests bringing 16 centuries – before I finished as I had begun, with my temperament losing control. Temperament transformations can happen very quickly sometimes: one instance that comes to mind demonstrates how fluctuations occur even overnight. We were in Sri Lanka – a tough place to tour! My past experiences there had been fraught, but as captain I was building a good temperament for the job. Yet facing a young Muttiah Muralitharan for the first time and thinking I saw a first-ball leg-spinner, I shaped to cover my off stump only to see the ball turn as an off-spinner and peg back my leg stump. His action had tricked me into thinking the opposite. That night, sleeping on a pair, I tossed and turned, convinced a second duck was coming. But my experience had taught me to visualise and imagine positive situations, not think negative thoughts or outcomes. And so, late into the night, I settled into a flight-not-fight mode, creating an inner movie of scoring freely against the Sri Lankan spinners. The next day, after just one hour’s sleep, I walked out to face the truth. What temperament did I bring? A quick single off the first ball – almost a run-out, but with overthrows giving me a five to get off the mark – calmed my anxiety and, as visualised, my confidence returned. Less than three hours later, I returned to the pavilion with a hundred. My temperament had been restored in the nick of time. Too often we witness players with excellent form in the first-class game suffering a horrendous reversal in Tests. Yet the game is still the same: only the intensity and consistency of bowling are increased a little. The anxiety becomes too much, the expectation debilitating, the thinking confused and stressed as past nightmares and future concerns kick in again, and the body freezes. In these cases talent alone clearly is not enough. Witness Mark Ramprakash – incredible in county cricket yet unable to succeed in Tests. The expectations of him from a young age were massive. It must have weighed him down. Conversely, Mike Hussey has proven that, once fully matured, he could thrive on the toughest stage, relying on attributes that dealt with any obstacle, simply by being himself. Temperament needs flushing out when things aren’t going well: out with the old and in with the new. Mindfulness is required – first to accept the situation: the need for help, perhaps; the desire to change, definitely. It takes brutal honesty, and hard work must be done before any attempt can be made to enter the cauldron again. Informal assistance may not be enough – disaster can be just one thought away, so calling on professional help is a sign of courage and common sense. Pain is to be respected and listened to, not shied away from, if the pleasure is to return. And so – like our body – our temperament too needs regular check ups. To not do this is to neglect the essence of living, of experiencing love and wisdom, of rebalancing heart and mind. Knowing why we were born, being aware of our potential, and being authentically who we are along the way are crucial to forming the foundation of our success.